1:Support 30 mm*50 mm size mSATA SSD converted into a standard 2.5" SATA interface or mSATA SSD to usb 2.0 interface. 2:If the adapter card to connect SATA6.0Gbps interface with computers,the speed and other properties is not changed,only form conversion interface,because such transformation does not need through the integrated circuit chip. 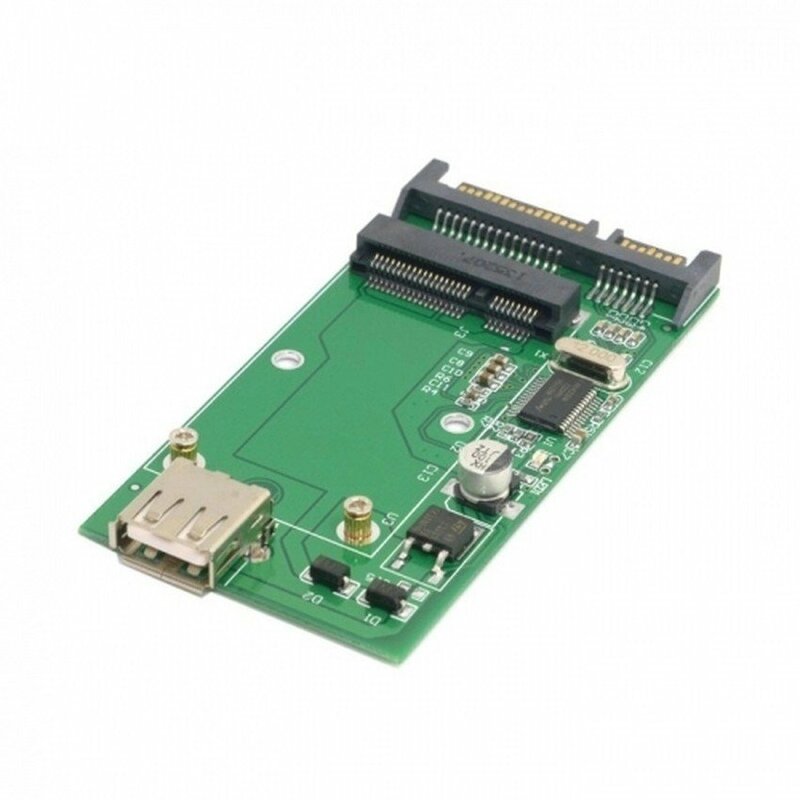 3:This product can support 30 mm*26 mm size mSATA SSD if change the position of the location column in the adapter card (Please put forward this request when buying goods if you have this need). 4:You can connect it to laptop or desktop,without any driver,but SATA port and USB port cannot be used at the same time! 5:The product only support mSATA Mini PCIE SSD,it dose not support SATA Mini PCIE SSD and PATA Mini PCIE SSD. Package include: mSATA SSD to 2.5" SATA6.0Gbps adapter card 1PCS. 1.Mini PCIe interface defined there are six,A: mSATA Solid State Drive,using SATA protocol;B: SATA MINI PCIE Solid State Drive,its nature is SATA interface,but the pin definition is different compared with mSATA solid State Drive; C: PATA MINI PCIE Solid State Drive, its nature is IDE interface;D: Raid mSATA;E:3G or WIFI module;F:Inter Turbo Memory.Six types of interface definition looks exactly the same,so please be sure to distinguish your solid state drive's interface definition. 1:Please identify interface definition of your SSD,determine the length of your SSD. 2:Please check your computer can support the SSD,some computer is too old,it is not compatible with SSD;There are some brand computer for a particular type of SSD is not compatible. 3:Please connect the adapter card in your computer hard disk drive interface test or with USB hard disk box to test the adapter card (Do not connect USB interface test if Your hard disk rated current is greater than 1.2A,because maximum power supply current is 500 mA of USB 2.0 port,maximum power supply current is 900 mA of USB 3.0 port),if the SSD with a test method can't identify by computer,change other test method to check the SSD,If still can't identify please try to replace a computer,this operation can be ruled out compatibility problems. 4:Mac OS and some digital camera system use disk format can't compatible with Microsoft system,new SSD if there is no partition,open the "my computer" can't see the ssd, please use the Disk Manager in Windows to delete the partitions or to create a new partition on the SSD. 5:Please together insert the USB cable of auxiliary power supply port if the adapter card to connect USB 2.0 or USB 3.0 interface with computers,Because of the rated current is 0.5 A of USB 2.0 port and the rated current is 0.9 A of USB 3.0 port. 6:This product performance is being improved unceasingly, like has the change, not separate informs even slightly.Pictures for reference only, subject to our available products.